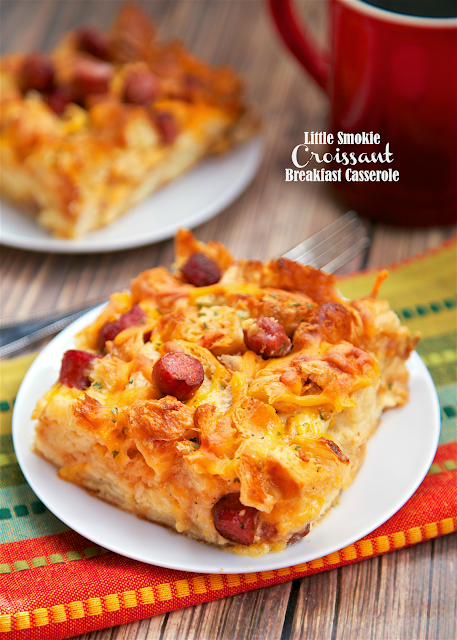 Little Smokie Croissant Breakfast Casserole - Buttery croissants, cheddar cheese, little smokies, eggs and milk. This casserole is assembled the night before and refrigerated overnight. Perfect for an easy weekday breakfast or overnight guests. We like to have this for dinner too! SO good! 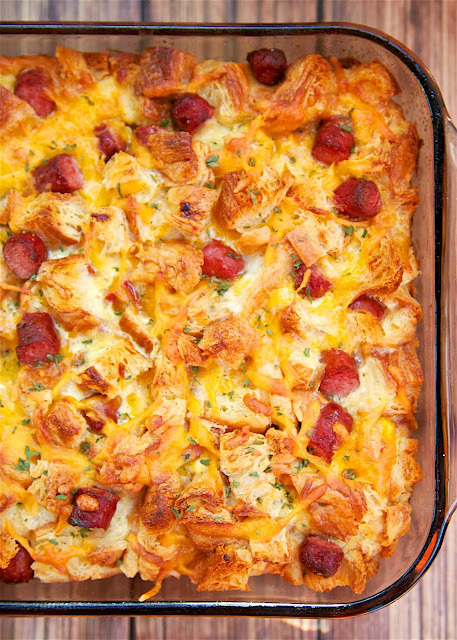 Everyone love this casserole! Breakfast casseroles are very popular at our house. This casserole is assembled the night before and refrigerated overnight. Perfect for an easy weekday breakfast or overnight guests. We also love to have this for dinner; you can't beat breakfast for dinner!!! 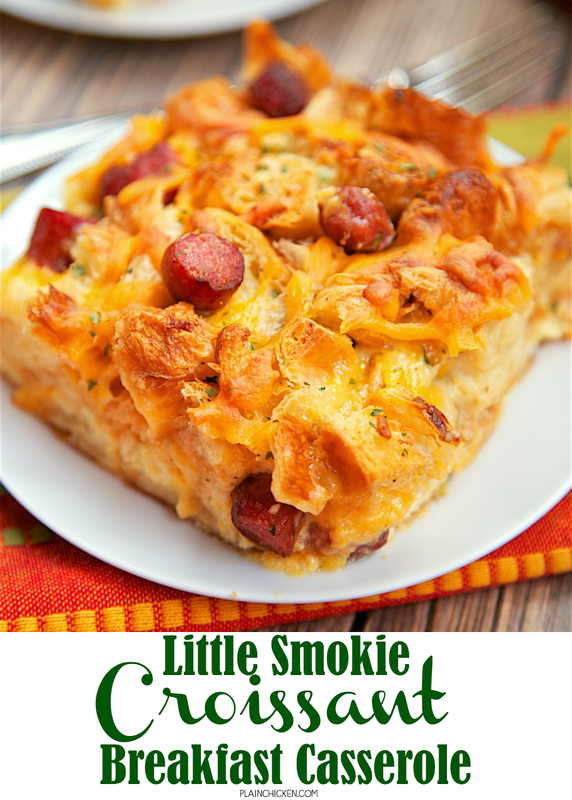 This Little Smokie Croissant Breakfast Casserole was a huge hit! How could it not be? Buttery croissants, cheddar cheese, little smokies, eggs and milk. YUM! This recipe calls for a package of mini-croissants. I found the croissants in the bakery section at the grocery store. They came in a 10-oz package. Chop little smokies and mini croissants into bite-sized pieces Toss together chopped little smokies, chopped croissants and cheddar cheese. Pour into a lightly greased 9x13-inch pan. Whisk together milk, heavy cream, onion powder, dijon mustard and eggs. Pour over croissant mixture. Cover and refrigerate 8 hours. Preheat oven to 350ºF. Uncover casserole. Bake 45 to 50 minutes or until golden brown. Let stand 10 minutes before serving. Croissant dough or prepared croissants? Really good. I divide the recipe in half, using 2 eggs instead of 5. Freeze the remaining croissants and little smokies for future use. Even half a recipe is generous, and a 9x13-inch pan will work. Thanks for a go-to recipe my family enjoys.